BANGUI, 17 February 2015 (IRIN) - Helping thousands of fighters in the Central African Republic return to civilian life presents a dilemma for aid workers: offer too many incentives and risk rewarding violence; offer too few and potentially fail to stem it. Either way, the process of disarming, demobilising and reintegrating (DDR) armed groups - according to the UN mission in CAR - is “absolutely indispensable”. Here’s a look at the challenges. How many combatants are there? Around, 2,000 in the coalition of predominantly Muslim insurgent groups known as Séléka, which held power in CAR for 10 months after a March 2013 coup, and 1,500 among the anti-balaka, the name used for disparate groups which coalesced to fight the Séléka. Together, they “pose a permanent threat to peace, security and stability,” according to an October 2014 report by a UN panel of experts on CAR. In addition, around 1,000 Séléka fighters are confined to barracks in the capital Bangui. 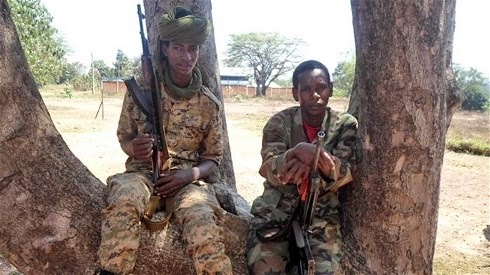 In November, a group of these fighters threatened to blow up an ammunition dump in the city if they did not receive back-pay they thought they were owed. Much higher figures have been quoted for the anti-balaka by its own leaders, such as Joachim Kokate (also a former government adviser on DDR), who claimed last December that they numbered 20,000 in and around Bangui and 50,000 elsewhere. Sources within the UN mission in CAR, MINUSCA, dismissed these figures as “way off the charts” and suggested a total of 3,000 to 4,000. Most DDR programmes offer some ex-combatants a chance to enrol in a national army – in theory after they have been vetted. The army officially has about 7,000 troops, but the actual number is probably around 3,000, and few of them have weapons. How ready is anyone for DDR? MINUSCA has drawn up a DDR strategy but says the programme won’t start until there is a credible peace agreement signed by armed groups and the government. The Séléka and anti-balaka have seldom fought each other since early 2014 - although they have continued killing civilians. An agreement signed in January by fringe elements of both groups has widely been dismissed as irrelevant. Kokate told IRIN that most of the anti-balaka have already “returned to their villages” where they are waiting for DDR. Mamert Sinarinzi, a spokesperson for MINUSCA’s DDR section, said last month that whereas DDR programmes in the past had been “aimed at individuals with weapons, a more community-based approach should now be envisaged.” Conventional DDR for those ex-combatants who are not enlisting with the army often focuses on providing individuals with money, tools and training for civilian life. In a community-based approach, reintegration incentives are offered to host communities as well as former fighters. Reintegration of ex-combatants can be as much an issue for communities as for the ex-combatants themselves. “Communities cannot be forced to accept people who may have committed serious abuses,” said the UN’s Food and Agriculture Organization (FAO) representative in CAR, Jean Alexandre Scaglia. The International Organization for Migration (IOM) says its cash-for-work programme in Bangui, which targets members of armed groups and the wider community, could be “a second generation alternative to DDR”. The programme employs “vulnerable people” for 10 days, mainly digging ditches, and pays them a total of 40 euros. Nearly 50 percent of the programme’s 7,800 participants in 2014 were women while about 10 percent were from armed groups. According to Colonel Kalle Seppala of the European Union force deployed in CAR to protect civilians and humanitarian operations, the programme has helped to reduce violence in Bangui. IOM hopes the programme will have reached 20,000 people, inside and outside Bangui, by September 2015. The agency reported that 43 percent of participants used the 40 euros they earned from the programme to start up a business as street vendors. However, IOM does not provide training in business skills, and other livelihoods. In some parts of Bangui there now appear to be far more street vendors than the market can sustain. The UN Development Programme (UNDP) is working on a $5 million project to train some 10,000 people as builders, auto mechanics, carpenters, electricians, metal workers and plumbers. UNDP’s livelihoods adviser, Eric Levron argues the training could foster a middle class of artisans capable of running productive businesses. In recent months, FAO’s mission in CAR has trained nearly 300 agricultural advisers in “farmer field school” techniques, a training due to be passed on to hundreds of additional facilitators all over the country. “The facilitators can help to create livelihood opportunities for ex-combatants,” said Scaglia. FAO’s CAR office also plans to hire a hunting expert to advise on how this important activity in remote areas could become more viable for communities and youth at risk. The agency is also looking at ways to help young cattle herders restart livestock production after their animals have been stolen or killed, when they become prone to recruitment by armed groups.